I often get emails asking how to pick stocks for trading and when I ask them about current trading system they show moving average crossover system, MACD crossover system, ADX or RSI. Trading using a single indicator on a single time frame is very risky as the market is very dynamic and complex. Trend following indicators are profitable when market is moving in a particular direction but it will lead to whipsaws in range bound market. Oscillators are profitable in range bound market but gives early exit signal if market trends in a particular direction. It is always good to analyze the market in different indicators like trend following indicators and oscillators. The Triple Screen Trading System helps you in easily analyze the market in different time frames and different indicators. As we see there are different types of investors/traders (institutional investors, long term investors, short term traders, intraday traders and retail traders) It is a good idea to understand the market in different time frames. Choose your time frame in which you are willing to trade. Intraday : 5 Min, 10 Min or 60 Min chart. Look at the long term chart with respect to your selected time frame above. If you are trading in daily chart then weekly chart is your long term chart. Thumb rule is your current time frame multiple by 5 or 6. Triple Screen suggests you look at the long term chart and trade only in long term direction. 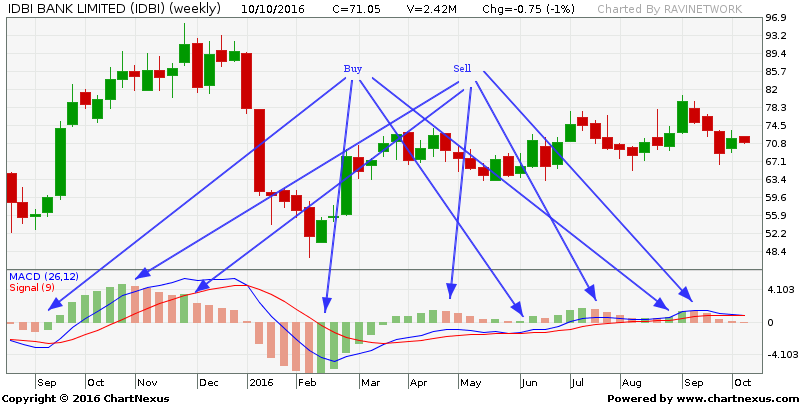 If long term chart is moving up then use dips as buying opportunities. There are three screens to find out this. Analyze the market in long term chart. Why long term chart? Market moves in the direction of strong hands. Most investors look for the weekly chart or monthly chart, they are not shaken by the daily whipsaws of the market so it is good to follow the strong hands. The first screen uses the trend following indicator to identify the long term trends. MACD Histogram can be used for this screen, When the slope is up it is buy signal and when the slope is down then it sell signal. Refer the below chart. The second screen identifies the wave which goes against the tide. When the weekly trend is up then use daily declines as the buying opportunity. When the weekly trend is down use daily rallies to sell. Oscillators on daily chart are used for the second screen. 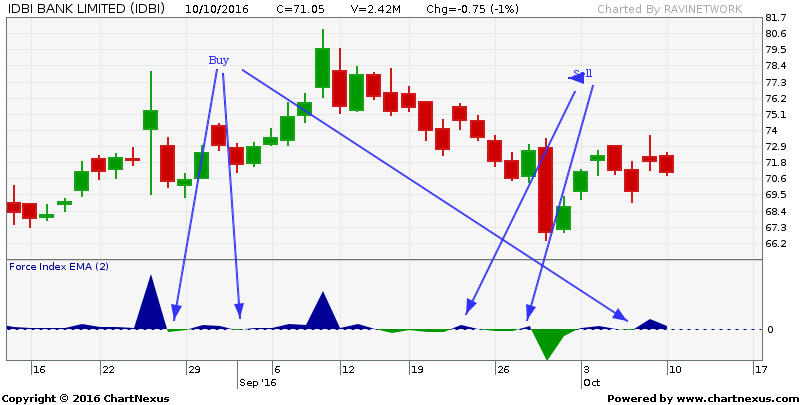 Oscillators gives buy signal when the market declines and sell signal when market rise. When weekly trend is up, trade only buy signal in the oscillator and ignore the sell signal. It means you are taking trades only in the longer time frame, by doing this you are always trading in the direction of strong hands. Force Index which is invented by Dr Alexander Elder is an excellent oscillator which shows the short term rise and fall. The 2 Day EMA of force index is one of the several oscillators which can be used for the second screen. Force Index shows buying opportunity when line falls below center line and shows selling opportunity when the line rallies above center line. When the weekly trend is up take only buy signal in second screen and when the weekly trend is down take only sell signals in the daily chart. First Screen identifies the tide in long term chart. Second screen will identify the waves which will go against the tide. Third screen will use the intraday price movement for pinpoint the entry points. When the weekly trend is up and the daily trend is down place the buy order one tick above the previous day high. If the price rises your order will be executed. If the price continues to decline you buy order will not be activated. Similarly with the sell order. Place Buy order one tick above the previous day high. Stop Loss : sell one tick below yesterdays low or todays low which ever is lower. Use trailing stop loss, keep increasing or decreasing to your previous day low or high depending on your position.